I knew when we decided to buy this house that front porch was going to be perfect for rocking chairs! So I started looking at yard sales, browing Craigslist and facebook yard sale sites, and even watching for clearance deals in stores before we even moved. I wasn’t finding any! After we got the bushes all cleared I was even more determined to find some rocking chairs. 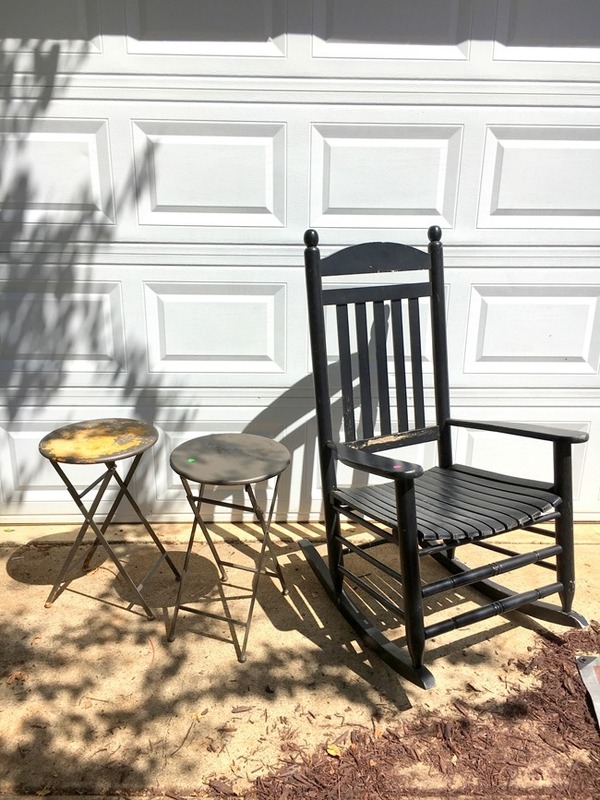 Then later that week I found 2 more black rocking chairs on a facebook yard sale site for $100 for the pair. And my mom found a clearance one at a store for $30. So within 2 weeks, I had all 4 of my rocking chairs for $150! Guess I was just waiting for me to have some profit from a yard sale I had to pay for them. 🙂 They typically sell for $100 each so I got 4 for less than the price of 2. Two of them needed to be painted – this one was a bit rough so I sanded those areas and then gave the whole thing a fresh coat of paint. And I forgot to take a before picture but the new one that was found on clearance was this yellowy pine color. This was during the process of painting. 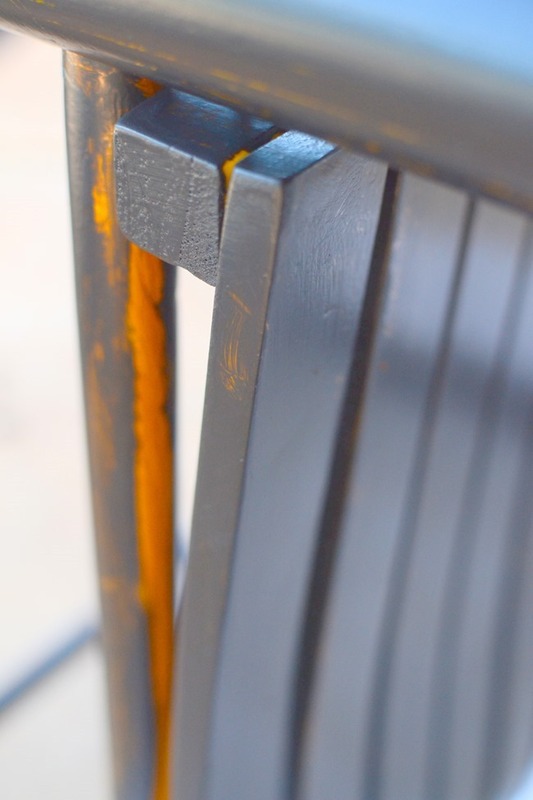 The whole chair got two coats of paint. 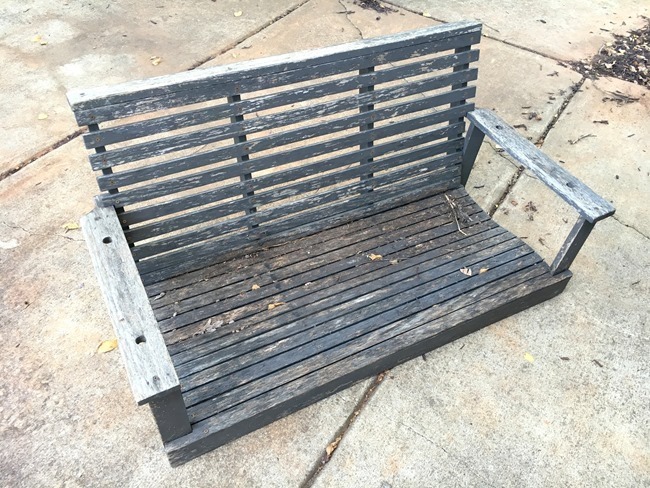 I used DecoArt Outdoor Living paint in black and seriously was amazed at how well it covered! I am currently partnering with DecoArt but I wasn’t doing this as part of a project with them – I just didn’t have any black latex paint and had the DecoArt paint on hand. I will definitely be using the DecoArt Outdoor Living paint again. I had also been thinking that the porch was also perfect for a porch swing! My mom had this old swing that she gave to me. 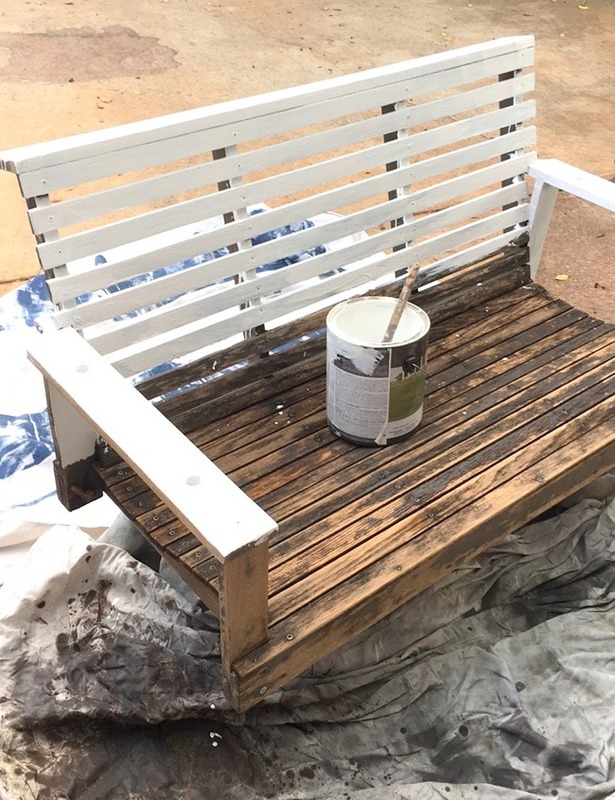 It definitely needed some work – I pressure washed it, sanded it..
And then gave it 2 coats of white paint! 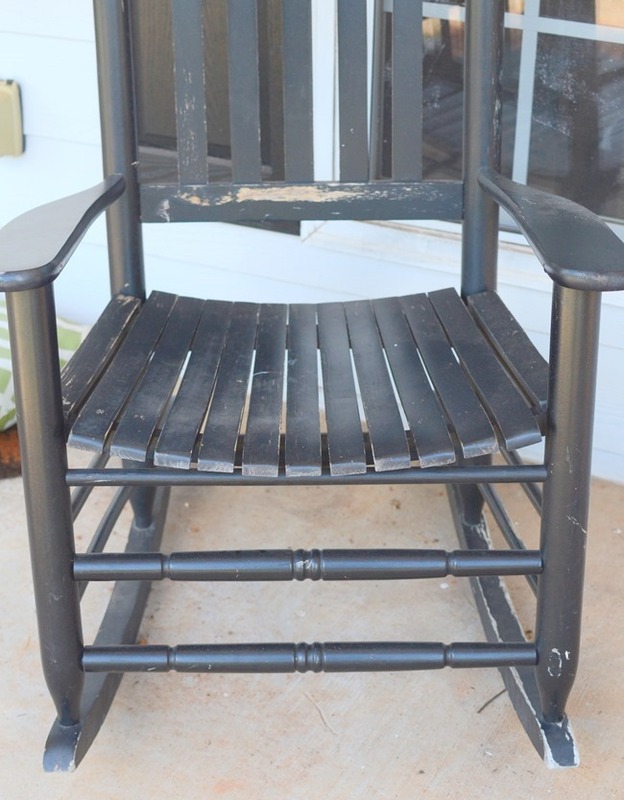 I painted it before I found the rocking chairs – I was thinking I was going to do white rocking chairs but when I found 3 of the 4 already black I decided to just keep them black for now. 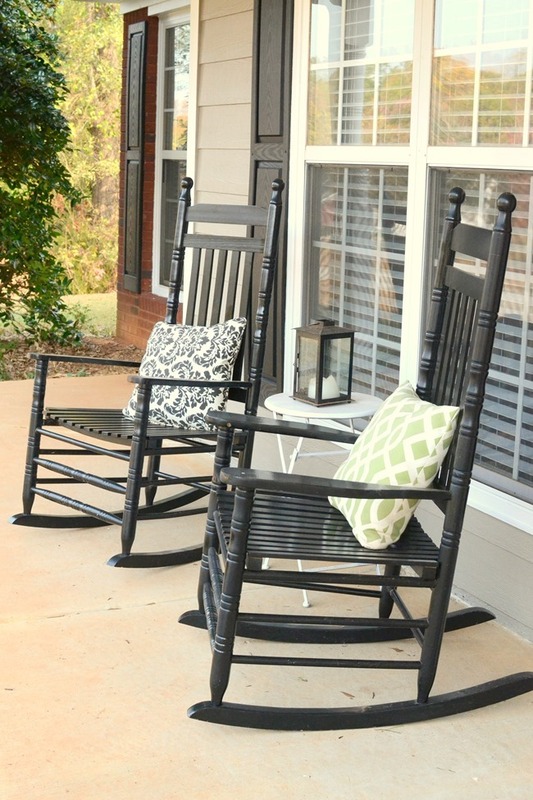 So here’s my rocking chair front porch! These are the 2 rocking chairs that I bought together – so they completely match. And these are the 2 I found separately. I need to pick up a two ball finials and screw in the top of that one chair and it would look just like the other ones. Not too bad for finding 4 chairs at 3 separate times and places and they match so close! I have to say my favorite is the porch swing – the late summer/fall weather has been perfect for going out there and swinging. When the baby gets fussy or I have just had a long day, we just go out there and swing! She loves it and so do I! So there’s my rocking chair front porch! Bargain hunted and found and painted this summer. I can’t wait to decorate this porch for Christmas and show you in a few weeks! 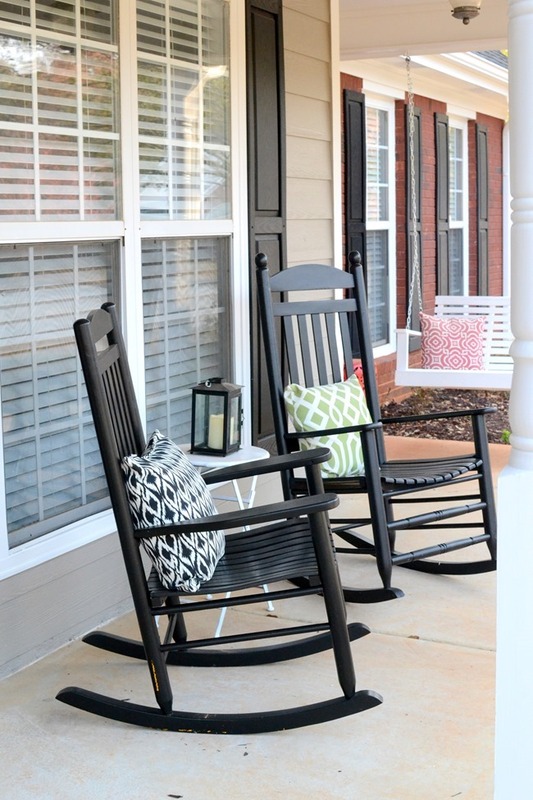 Would you leave the rocking chairs black or paint them white? And what about the swing? Leave it as is or paint black to match? I like the chairs and swing just as they are. The chairs look great in black, and the white swing and tables are a nice contrast. 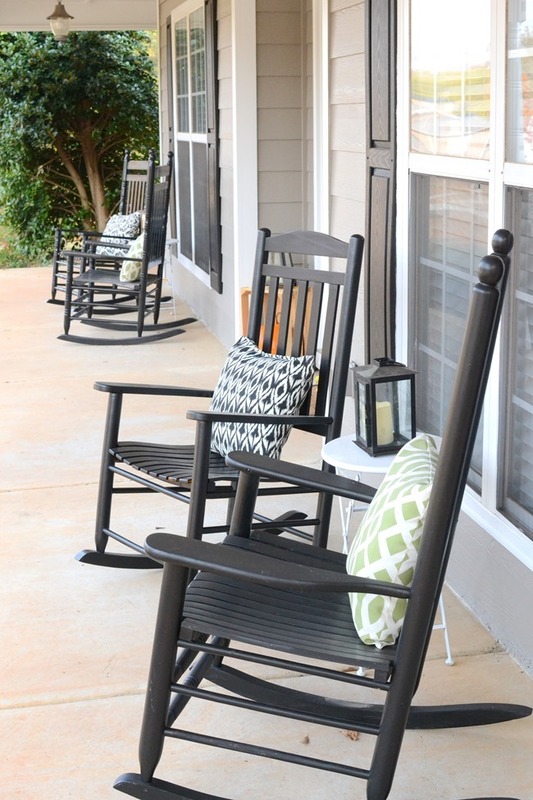 I’m so glad that you found 4 rocking chairs for your porch, they look so pretty and comfortable! We had a porch swing when I was a child and I loved sitting out there in the summer Time! I think that for now I would leave the paint colors as they are and then paint the swing black next spring. The black chairs make a nice contrast against the background of your house. I think the white swing is a nice contrast with the brick wall, and the black chairs contrast well with the white windows and concrete floor, so I think they are perfect as they are? If anything, I would maybe paint the tables a nice pop of color, like red or green, but they look nice as is. Leave everything as is – looks lovely! The front porch looks great! I think you should leave the chairs and swing just as is! It looks like you painted the front siding! I like them either way. Your porch looks so inviting! I just love it. By-the-way, your site has so many ads that sometimes it slows down my computer and I have trouble viewing your site. Is there any way that you can possibly limit the ads? A very nice contrast between the chairs and swing. The rocking chairs also match the shutters. Great job finding all 4! 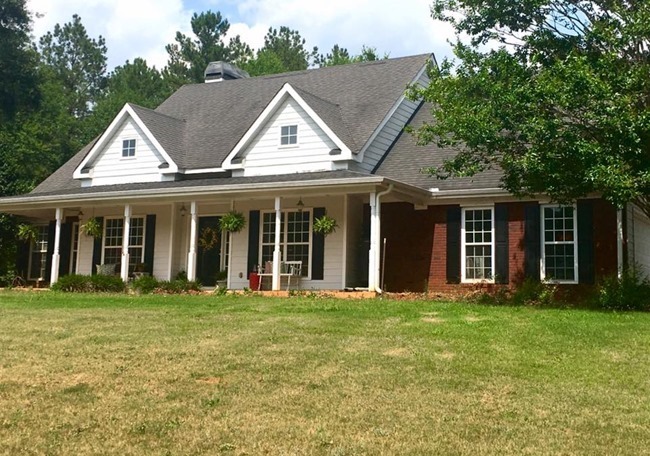 Hey Christina – I LOVE the addition of the rocking chairs and porch swing to your front porch! My grandmother had a porch swing when I was growing up, and it was such fun swinging on it, especially with her! 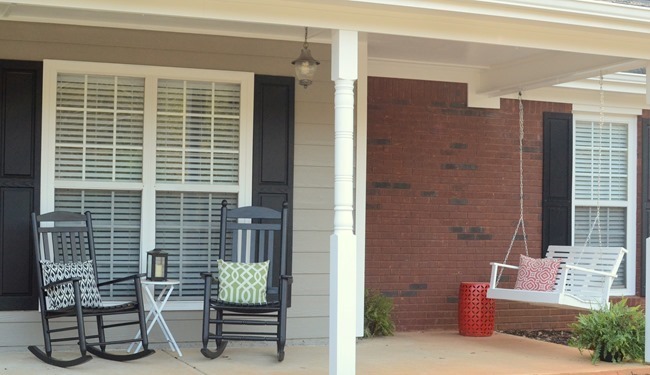 I would definitely keep the chairs black – they look amazing with the shutters and are a good contrast with the house and the brick! I like the swing white, but would also contemplate it black, too – because of its close proximity to the brick, and the great contrast. I’ve tried and tried to earn the “bonus points” and figure out what other change you’ve made…….new light fixtures on the porch? A new storm door? Other than those guesses, I’m stumped!! 😉 Looking forward to seeing how you decorate the porch for Christmas! Blessings….. I would leave the paint colors the way they are and just use cushions for color. I like that the tables are white, they help tie the swing and the chairs together. I think your porch looks wonderful just as it is. The white tables anchor the space together perfectly! So pretty and comfy looking. Enjoy ?